Fronting the Forbidden City, the sweeping square of the Gate of Heavenly Peace—Tiananmen Square—is the soul of China and the world’s largest square. The vast expanse of paving stones covering 100 acres is a colossal statement of state power. Chairman Mao is interred here and the monolithic Chinese parliament overlooks the square. Tiananmen Gate with its huge portrait of Mao is the viewing stand for military parades. In the centre of the square stands the Monument to the People’s Heroes. South of this is the Mao Zedong Mausoleum, where the waxen-faced great helmsman lies in state. The hall was constructed the year after Mao’s death in 1976. The square doubles as a huge park, with couples strolling languidly hand in hand, children playing, and enthusiastic kite flying. At the heart of Beijing lies the Forbidden City, probably the greatest palace complex in the world and the most powerful symbol of China’s dynastic past. From here, 24 emperors of the Ming and Qing dynasties reigned, aloof from the rest of the world, from the 15th Century until 1911, when the Republican Revolution began. The beauty of the Forbidden City lies not so much in any one building as in the ordered rectilinear layout of its temples, palaces, and gardens. According to the Chinese world-view, every emperor was authorised to rule by the Mandate of Heaven—the consent of the gods. In the cosmic triad of Heaven, Earth and Man, the emperor as Son of Heaven was seen as the mediator responsible for bringing about order and harmony on earth. 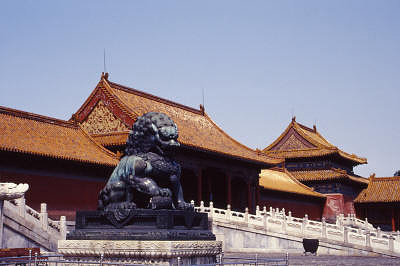 The ideal state was characterised by balance and hierarchy, and the symmetry of the Forbidden City reflects this. A central doctrine which played a fundamental role in the siting of early Chinese cities was feng shui or ‘wind water’: the traditional art of siting houses, public buildings and tombs in harmony with the earth’s vital energy. Feng shui, which embraces practical, aesthetic and mystical considerations, likewise underlies the planning of the Forbidden City. Buildings were aligned along the north-south axis, with all major buildings facing south, the direction of the sun’s beneficence and, therefore, of holiness. The scale, splendour, elegance, and craftsmanship of the city is both alluring and magnificent. The fact that it still survives today is no less a marvel. The palace was built primarily of wood, so fire was a constant hazard, and it regularly burned down. The Manchus who swept down from Manchuria to install the Qing dynasty (1644-1911) put the palace to fire in the 17th Century. The Japanese and Chinese Nationalists both ransacked it. The whole complex was almost torn apart during the Cultural Revolution (1966-1976). Purple Forbidden City, after the Purple Luminous Constellation which has the Pole Star at its centre, was the full name of the emperor’s imperial palace. As the heavens revolved around the Pole Star, so the earth revolved around the emperor. His Dragon Throne was at the centre of not only the main hall, the Forbidden City, the Imperial City and the Inner City, but also, so the Chinese believed, of the world. It was after the Mongol dynasty were driven out by the Ming in 1368, that the Forbidden City as it is known today, was created. Building began under the emperor Yongle in 1421, possibly on the very site of Khubilai’s old palace. It took one million men 16 years to complete. Over the centuries, buildings were added, refurbished or renovated; the palace, a resulting microcosm of 500 years of Chinese history. This vast labyrinth of tile-roofed buildings, comprising 9,999 rooms and chambers decorated with mythological creatures, is spread over 250 acres. There are audience halls, pavilions, marble steps and balustrades, bronze lions and incense burners, as well as gracious formal gardens. Following traditional palace design, government officials worked in the southern part of the city, whilst the imperial family lived in the north, behind the Gate of Heavenly Purity which divided the two areas. No adult male other than the emperor himself was allowed into the residential quarter, which was heavily guarded by eunuchs. Entry to the grounds of the Forbidden City was, and still is, by the massive Meridien Gate, from which the emperor would review the imperial army. Drums and bells were sounded when the emperor passed under the gate’s central door. Beyond the gate lies the Golden Stream, a canal shaped like a bow and spanned by five marble bridges. 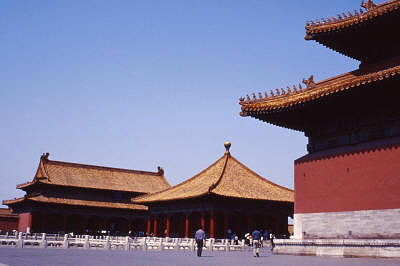 From here the Hall of Supreme Harmony, the most important of the ceremonial buildings, rises on its three-tiered terrace. Inside was the centre of the Chinese world, the Dragon Throne, where, surrounded by bronze incense burners and gilt columns, the emperor presided as the Son of Heaven. In this hall grand ceremonies were held to celebrate occasions such as the winter solstice, the new year and the emperor’s birthday. Behind the Hall of Supreme Harmony lie the Hall of Middle Harmony, and the Hall of Preserving Harmony, where banquets were held for foreign dignitaries. North of these halls is the Gate of Heavenly Purity leading to the residential quarters, namely, the Palace of Heavenly Purity and the Palace of Earthly Tranquillity, used as residences for the emperor and empress respectively. Between the two palaces lay the Hall of Mutual Ease, which symbolically united emperor and empress and, therefore, heaven and earth, yang and yin, and male and female. Beyond the palaces lay the imperial gardens. 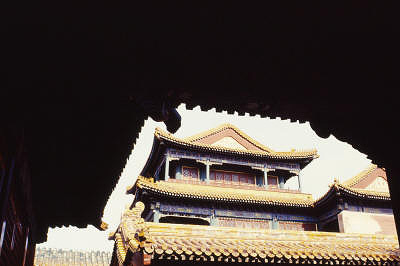 Apart from its palaces and halls, the Forbidden City contained temples, gardens, libraries, theatres and living quarters for the thousands of resident servants, eunuchs and concubines. Concubines, who were protected and served by eunuchs, could improve their status by bearing the emperor a son. Symbols abound in Chinese imperial buildings. The dragon denotes the emperor and the phoenix represents the empress. The two are often depicted together. The nine animals on the roofs signify the nine children of the dragon and phoenix. The image of the dragon chasing the flaming pearl portrays the quest for purity, while the lavish yellow tiling of the roofs symbolizes the emperor, a colour often seen in imperial porcelain as well. The Chinese lion, a playful looking creature with a curly mane, is commonly seen sitting in pairs outside buildings of note. The female holds her baby under one paw [the Chinese believed that lions could secrete milk through their paws], while the male plays with a ball. After nearly five centuries, rule from the Dragon Throne ended with the outbreak of the Chinese Revolution in 1911. The six-year old boy Emperor Pu Yi was forced to abdicate by the leaders of the new republic, though he was permitted to live on in the Imperial Palace until 1924. In 1949, Chinese Communist forces took over Beijing and the defeated Nationalists fled to Taiwan, taking with them many treasures from the Forbidden City. Cloisonné is an art form native to Beijing. Also called “copper body and wire inlaid enamel” it has a long-standing history of several hundred years. The manufacture of cloisonné ware is a rather elaborate and complicated process, including base hammering, copperwire curving, soldering, enamel fitting, enamel firing, polishing, gilding, amongst others. Varieties available are commonly vases, but jars, bowls, plates are also popular. Opera emerged from popular theatre, the latter an art form which flourished during Mongol Yuan dynastic rule (1279-1368). There are many regional forms of Chinese opera, each with its own stories, costumes, make-up, and music. The most famous of the regional opera, the Beijing Opera, reached its peak during the Qing dynasty. Chinese opera has little similarity to western opera. The popular stories are shrilly sung to the clashing of cymbals by heavily made-up performers. The roles can be very demanding with leaping, jumping, and often energetic routines that require both flexibility and endurance. Characters are identified by their make-up and clothing. Roles are generally divided into male, female, warriors, heroes, and clowns. Training for the Beijing Opera is severe, and it was earlier usually reserved for orphans. Martial art supremos like Jackie Chan learned their moves through training in the Beijing Opera. This entry was posted in China, Exploring our World and tagged Ancient China, Chinese Civilization, Chinese Opera, Cloisonne Ware, Ming Dynasty, Mongol Dynasty, Qing Dynasty, The Forbidden City, Things to do in China, Things to see in Beijing, Tiananmen Square by Rama Arya. Bookmark the permalink.